Are you sick of hiding your smile due to misaligned teeth? Follow these three steps in order to obtain great Invisalign results. Do you wish you had worn your retainer more often after getting your braces off in middle school? Don’t worry, there’s a treatment for your teeth that doesn’t require braces. Instead, you may be able to upgrade your smile with the help of Invisalign. But, the aligners don’t do all the work. You have to put in your end of the bargain, too. Here are three things you can do to make sure you get the best Invisalign results possible. Wearing your set of Invisalign aligners is a full-time job. Actually, it’s more than that, because you’re supposed to have them on for 20-22 hours a day. That means you have to wear them when you sleep, when you work out, and even when you have a hot date. Only take them out for meals, and even then you have to watch the clock. Be mindful of how often you’re taking your aligners out to eat and how the time adds up. To make the most of your time, plan ahead. Buy a couple of travel toothbrushes and small tubes of toothpaste. Keep them with you wherever you go and ideally brush after every meal. Carry them in your purse, at your desk, and even in your gym bag. This way, when you need to put your aligners back in after lunch or your pre-workout snack, you won’t have food stuck in your teeth. If your schedule or location does not permit this, you can rinse with water and put your aligners back in, then be sure to brush and floss once in the morning and once at night before bed. If you are a coffee, tea or wine drinker realize that you will need to change your drinking habits so you can keep your aligners in 20-22 hours a day. It can be used as a good incentive for cutting back! Aligners will be stained by these drinks, but more importantly you don’t want sugars and acids trapped between your aligners and teeth causing accelerated tooth decay. Follow the rule: In your face, in your case, no other place. Placing aligners in a napkin, cup or open on your nightstand while your dog is around is a sure way of losing them. This can be handled by moving up to the next set of aligners, but you don’t want to make it a habit since the micro-movements of your teeth caused by each set aligners weave into the next set making it a comfortable transition. It’s best to stick to the exact treatment plan laid out by your Orthodontist. On top of regular tooth-brushing, be sure to clean your aligners. There is a lot of nonsense on the internet where people share opinions about how to clean their aligners. They even include advice that would be toxic or would ruin aligners (like boiling them!). There are nice kits specifically created for cleaning aligners and you can invest in one if you wish, but the truth is that any toothpaste with a good soft toothbrush applied directly to your aligners brushing them inside and out will do the job. The last tip to make sure you get the best Invisalign results is to find the best orthodontist! 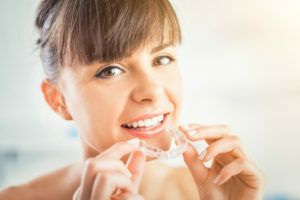 You need an experienced Invisalign Provider who knows how to use custom attachments and elastics in the most efficient and comfortable manner to give you the best results in the least amount of time. Look no further than Alborzi Orthodontics. Our team is ready to give you the smile you’ve been dreaming of. Contact us today to set up a consultation and start your Invisalign journey.